The piezoelectric accelerometers shown on this page are intended for standard applications in laboratory and industry. There are models with charge output and with IEPE compatible voltage output. All types have stainless steel cases and M5 base threads for mounting. The transducers of KS series have a shear type sensing element making them less susceptible to thermal transients and base strain. 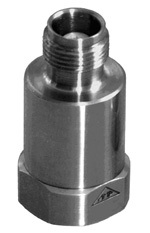 The accelerometers of KD series have a compression type sensing element combining rugged design, precision and low cost. For measurements below 3 Hz generally shear type accelerometers of KS series should be preferred. Models KS56 and KS57 can be used at temperatures up to 250 °C (480 °F). The low-cost accelerometer KS90 and KS901 are intended for OEM applications in machines or instruments. Model KS90 can be used in charge mode or, with a high-impedance voltage amplifier, in voltage mode. Model KS72L with Low Power IEPE output was developed for applications demanding low power consumption, such as sensor telemetry.